The Imperial Bells of China returns to Australia in May and June with a new production which incorporates new elements of dance and folk songs. Experience the lost world of “Ten Kingdoms” with exquisite ancient costumes and magnificent production. In 1978, the 2,400-year-old bronze and stone chime-bells of Duke Zeng’s Tomb, together with a series of other ancient instruments, were unearthed in Hubei China. Inspired by these discoveries, Hubei Opera Theatre staged the Chime Music and Dance performance bringing song, musical instruments and dance together, and puts bronze, stone, jian drum and dozens of other ancient instruments on the same stage. 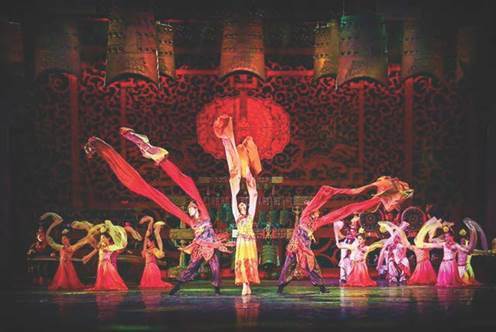 Through this artistic style the beautiful ancient music and dance of China are brought alive together on one stage. Not only is the sound of the bells filled with romantic and sonorous melodies but they are also visually breathtaking due to their grand scale and elaborate cast technique. Discovering the music, cultural and spiritual history and being taken away by the ethnic folk dancers and musicians all set in 900s, is part of what makes this show unique. The Imperial of China represents a ritual in China’s outbound cultural exchanges, it has been performed in front of Chinese President Xi Jin Ping, Egyptian Present Abdel Fattah, The king and queen of Belgium and many more during the official visits and all across 57 countries and regions for more than 1000 times. The Chime of Bells, has been recognised as a significant contribution to the heritage of Chinese music. From the earliest historical periods, particularly in ritual music from the Bronze Age onward, bells have been an essential component of instrumental ensembles in China. They were endowed with strong emotional and cultural connotation which carries on becoming an aspect of progress in social belief. As a result, the bell culture developed further, they were no longer simple bells for practical uses but rather a symbol of an idea, culture and spirit. These impressive bells had been an important feature during the 11th Asian Games and 2008 Beijing Olympic Game as well as many other international cultural performances. DanceLife has double passes to give away to The Imperial Bells of China in Sydney (May 25), Canberra (May 31) and Melbourne (June 4). To enter, send your answer to the following Question along with your name and contact number to win@dancelife.com.au. Q: In which year and city were the ancient bells unearthed?